There are at least twelve US warships and at least one Israeli warship lurking in the Red Sea as an Iranian Iranian Red Crescent ship prepares to sail to Gaza to break the illegal blockade. The armada includes one US aircraft carrier (the Harry Truman). Three Israeli nuclear-armed subs are also believed to be operating off the coast of Iran. Should there be a clash, it could be an act of war. The Red Crescent is the equivalent of the Red Cross and is expected to carry only around 10 volunteers and humanitarian aid. Iran said Tuesday it would send a blockade-busting ship carrying aid and pro-Palestinian activists to Gaza, fueling concern in Israel, where commandos were training for another possible confrontation at sea. The AP story (and most coverage within the USA) is apparently wrong, unfortunately. The Prime Minister's Office announced on Thursday that the security cabinet had agreed to relax Israel's blockade on the Gaza Strip, but as it turns out, no binding decision was ever made during the cabinet meeting. It appears, from other reports, that there may be some easing, but it needs to be more than toothpaste. Building materials and parts necessary to re-build Gaza’s bombed-out infrastructure are apparently still not to be allowed. No one, in the tightly-packed enclave of 1.7 million people is allowed to leave, and exports, which could provide badly needed income, not permitted. Regardless, Israel has made one more change in the blockade that could point the way to a military confrontation with Iran—it has re-characterized the blockade as military rather than civilian. 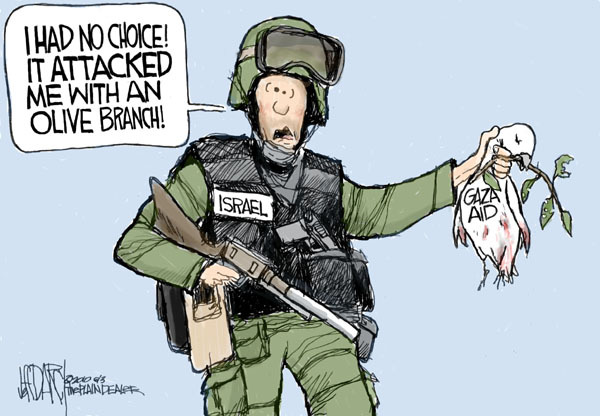 By changing it from a "civilian" blockade to a "military" one, in one stroke Israel pacified the international community and gained their approval (or at least a nod) for its continuing policy in Gaza. Should the Iranian ship advance towards Gaza, it will presumably be allowed through the Suez Canal. The question is how and where the Israeli and American armada will confront the ship. So far, the world appears to be indifferent to what could be a deadly clash, one that both Israel and the US may have been scratching their heads on how to accomplish for some time. A peaceful Iranian relief ship may give them their first opportunity. Please also see this great illustration. More cartoons by Jeff Darcy, The Cleveland Plain-Dealer, are here.